The Wisdom of Communities is coming – will you help us reach our stretch goal? The Wisdom of Communities is coming! Will you help us bring it to more people? Crowdfund Goal Reached – Thanks to people like you! 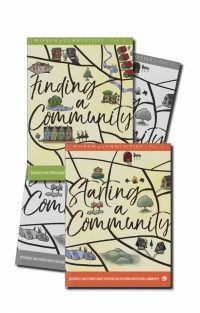 Thanks to people like you we reached the $4,000 crowdfunding campaign goal to publish our new 4 volume series, Wisdom of Communities. But, seeing that we have 6 days left in the campaign, let’s raise the bar! Our new stretch goal for the campaign is $6,000. Can you help us to reach it? Please share this campaign with your friends, so that we can build on the success and support Communities magazine’s educational mission to spread Cooperative Culture! Since 1972, Communities magazine, published by the Fellowship for Intentional Community, has been collecting and disseminating the lessons learned, and now we’re distilling them into a new 4-volume book series, Wisdom of Communities. Each book is over 300 pages, featuring over 100 of our best articles. Please support our crowdfunding campaign. Donations of up to $100 will be matched dollar-for-dollar up to $2500 through the Fund for Democratic Communities, a foundation that supports community-based initiatives that make communities better places to live and thrive. Intentional communities go by many names: ecovillages, cohousing, co-ops, and more, but they share common qualities and common struggles. 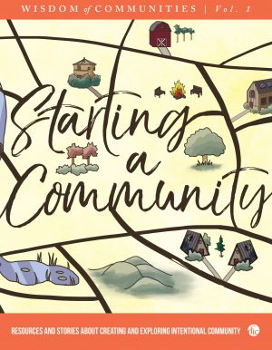 First off, how do you start a community? The magnitude of this task cannot be overestimated and if you’re thinking about taking it on, thank you for your courage and generosity! We think the articles collected in volume one of this series will help you. Second, there are lots of communities out there, forming and established, that want you! How do you join a community? Volume two addresses this question. Finally, how do we address the overwhelming issues of global ecological deterioration? Together, in community, and volume 4 offers insight into how we can do this. We want to see the numbers, longevity, and vibrancy of intentional communities increasing around the world. We believe this series can help community founders, seekers, current communitarians, students, and researchers alike in their journeys. Please make a donation now through our Kickstarter campaign and share the campaign with others before February 26th. Help us share the Wisdom of Communities with the world!